"UDT Make" lifting subs can be either tapered or square shoulder types and are made from AISI 4145/4140. They are available in all diameters and lengths. 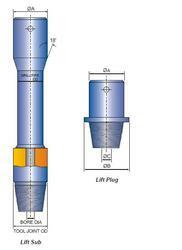 A) LIFT PLUGSPARVEEN manufactures lifts plugs to suit various sizes O.D. drill collars. Bottom portion is threaded, the center section is bored to reduce weight. Manufactured from materials & heat treated to drill collar specifications. 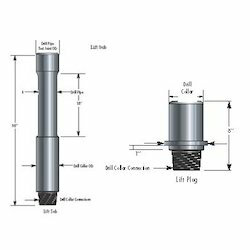 OCTL Lift Subs are made from AISI 4140/ 4145H modified alloy steel, fully heat treated to a Brinell Hardness range of 285 – 341 and have an IZOD impact strength of minimum 40 ft-lbs. The connections are machined, cold rolled, and phosphatized to prevent galling during initial make-up, and are shipped with pressed steel thread protectors installed. All crossover sub, basket subs, lift plug and lift sub are manufacturing from ultrasonically tested 4145 h modified alloy steel. These are fully heat treated to a brinell hardness range of 285-341 and have an izod impact strength of 40 ft/ib minimum. The substitutes are made in all size as per requirement of customers. Conversion Sub Acts For Conversion And Connection Of Drill rod Component In water well, mining And Geology Drilling Work. It Is Used Mainly For Connecting Of Upper Drill Tools And Lower Drill Tools During Drilling Operations. Lifting Subs are made from 4145H modified Cr-Mo alloy steel ACC. to API Spec.7. All threads are phosphated, copperized or cold worked. At Extreme Oilfield, we manufacture Subs (magnetic and non-magnetic) of below kinds. Lift subs are used for safe lifting of BHA components and manufactured from 4145M or 4140HT alloy steel. They are of one piece construction and come in varying diameters and lengths. Lift subs can be supplied with an 18o tapered shoulder or with a square shoulder.